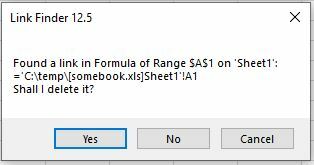 This popular utility is an Excel add-in which searches a workbook for a specified string (usually representing a link to another workbook) and tells you where in the workbook it occurs, optionally replacing formulas that include the string with their current values. and, by replacing the formulas that contain the links with their values it can prevent the message from appearing in future. You can choose whether to install FindLink as an add-in so that it is available whenever you are running Excel or whether to just open it when you want to use it. If you are warned about the presence of macros in the file, enable the content. If you are offered the opportunity to trust the publisher (Bill Manville Associates), do so. It looks through the active workbook for formulas that include a string specified by the user. It looks in defined names, cell formulas and also in any objects which can be linked to data in cells (e.g. chart series, data labels, textboxes, data validation lists, conditional formatting formulas). 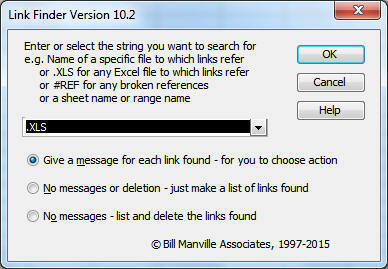 Note: If you are looking for links to an installed add-in they will not be found unless you either de-install the add-in or launch Excel in Safe mode (hold down Ctrl key while starting Excel) to prevent the add-infrom loading. If you use Safe mode you would then need to open FINDLINK explicitly. Copyright © 2015 Bill Manville Associates. All Rights Reserved.